In this, our silver anniversary of presenting awards for the best in the banking industry worldwide, Global Finance announces gold medal winners in 149 countries and territories and seven regions. Much has happened in banking from regulatory and technological viewpoints in the past 25 years. The pace of change is accelerating, with banking in remote regions of the world leapfrogging into 21st-century delivery systems via mobile phones. As banking inclusion expands, and technology provides new ways to offer convenience to consumers and corporate treasurers alike, new competitors are entering the arena. These include telecom providers, shadow banks, cryptocurrency issuers and peer-to-peer lenders, and even Amazon. “For banks globally, 2018 could be a pivotal year in accelerating the transformation into more-strategically focused, technologically modern and operationally agile institutions, so that they remain dominant in a rapidly evolving ecosystem,” Deloitte says in its banking outlook for this year. Meanwhile, expectations of a broad regulatory pullback could be misplaced, according to Deloitte. Some US regulations are being reviewed and may be amended. However, higher capital and liquidity requirements, stress testing, and recovery and resolution planning will likely remain intact, the firm says. Regulators are expected to remain vigilant and to demand more data from banks, Deloitte adds. With these awards, Global Finance honors those banks with the qualities that corporations should look for when choosing a bank. The winners are not necessarily the biggest banks, but rather, the best. They are banks that attend carefully to their customers’ needs, often in difficult markets, and accomplish the best results while laying the foundations for future success for themselves and their customers. All selections were made by the editors of Global Finance after extensive consultations with corporate financial executives, bankers, banking consultants and analysts throughout the world. We invited banks to submit entries supporting their selection. Our criteria included growth in assets, profitability, strategic relationships, customer service, competitive pricing and innovative products. In addition, a poll of Global Finance’s corporate readership was conducted in order to increase the accuracy and reliability of the results. Global Finance editors, with input from industry analysts, corporate executives and technology experts, selected the winners for the Best Bank Awards using entries provided by banks and other providers, as well as independent research, based on a series of objective and subjective factors. It is not necessary to enter in order to win, but experience shows that the additional information supplied in an entry can increase the chance of success. 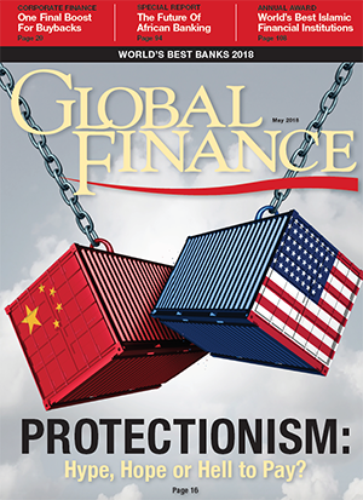 In many cases, entrants are able to present details and insights that may not be readily available to the editors of Global Finance. Judgements were based on performance over the period from the January 1, 2017 to December 31, 2017. We applied an algorithm to shorten the list of contenders and arrive at a numerical score, with 100 equivalent to perfection. The proprietary algorithm includes criteria—such as knowledge of local conditions and customer needs, financial strength and safety, strategic relationships and governance, competitive pricing, capital investment and innovation in products and services—weighted for relative importance. Once we have narrowed the field, our final criteria include scope of global coverage, size of staff, customer service, risk management, range of products and services, execution skills, and smart use of technology. In the case of a tie, our bias leans toward a local provider rather than a global institution. We also tend to favor privately owned banks over government-owned institutions. The winners are those banks and providers that best serve the specialized needs of corporations as they engage in global business. The winners are not always the biggest institutions, but rather the best—those with qualities that companies should look for when choosing a provider.